At least two security software suites are struggling with Windows 8.1, leaving users potentially unprotected as they upgrade to the new version of Microsoft’s operating system. Microsoft made it clear that apps added during the Windows 8.1 preview period would need to be reinstalled after upgrading to the General Availability (GA) release. But Check Point Software’s Zone Alarm Suite and the Comcast-supplied Norton Security Suite appear to providing additional headaches—in some cases, they simply have stopped working. While I upgraded to and negotiated the Windows 8.1 upgrade process on my Surface Pro, I left another Windows 8 PC untouched until after the GA release. I then upgraded the PC. On Sunday night, I noticed the “Solve PC Issues” flag on that PC was highlighted. 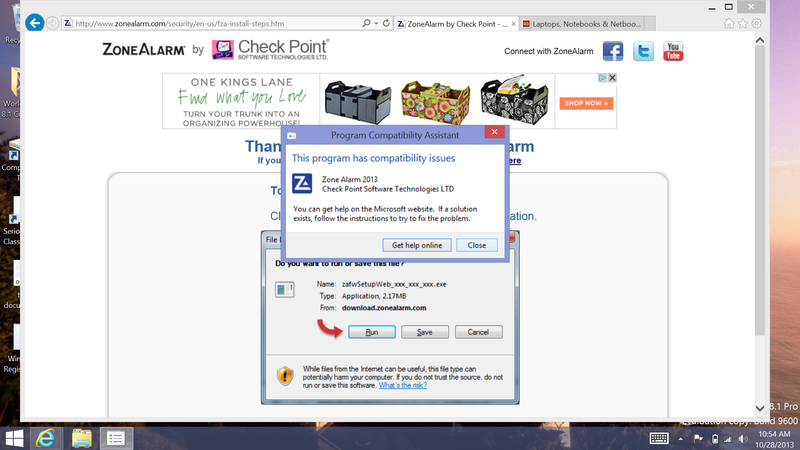 The problem, as it turned out, was that the Zone Alarm free firewall wasn’t working properly. Similar problems have been reported by users trying to use the version of Symantec’s Norton Internet Security suite that Comcast bundles as part of its high-speed Xfinity broadband service. It wasn’t like Microsoft didn’t give an early warning to developers to upgrade in time for Windows 8.1—in fact, after Microsoft initially decided not to provide Windows 8.1 via its developer channels, it relented and reversed course. Late in August, Microsoft began shipping the final version of Windows 8.1 to OEM customers. 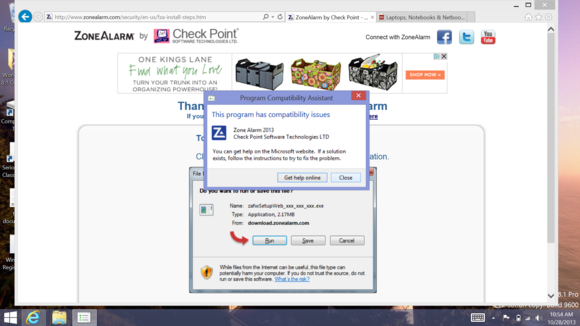 In fact, if you own a WIndows 8.1 machine and want to download a ZoneAlarm product like the free firewall, you can—but be aware that Windows will alert you of a compatibility error and prevent you from installing it. 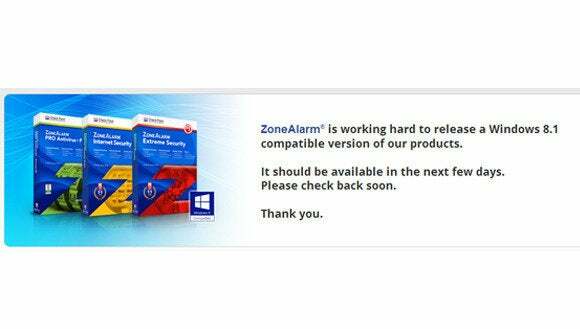 At this point, Check Point can only offer a beta version of Zone Alarm Extreme that includes Windows 8.1 support—but, as this thread notes, it’s a beta, with all the corresponding problems that betas could bring to the table. A spokeswoman for the company said that a Windows 8.1 compatible version of the software would be released this week, and customers running Windows 8.0 would be notified that it was safe to upgrade. Both Intel’s McAfee division and the Symantec Norton security utilities also appear to have negotiated the Windows 8.1 transition without problems. That’s not the case for those users who downloaded the software via Comcast. A thread on the Norton forums details some of the problems: after upgrading, users are informed that Norton Internet Security isn’ty available in compatibility mode. Comcast has yet to post the fully supported version of NIS 2013, but—as the engineer noted—users can install a trial version in the interim. If you do discover that your firewall or security suite has been disabled following a Windows 8.1 update, at least ensure that Windows Defender is up and running; it’s better than nothing. ]But problems like these may inspire you to consider re-evaluating your security provider—if you’ve been left in the lurch, you might want to consider a more dependable developer. Updated at 4:27 PM with a statement from Check Point.